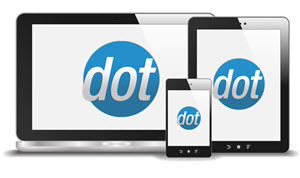 1 - Download the SOAP SDK for .NET 2.0 from CyberSource and install it. You also need to download and install the WSE 3.0 components from Microsoft. 2 - After installation go to the CyberSource folder (by default, it’s located in ‘c:\Program Files\CyberSource Corporation’) and copy the contents of the \LIB directory to your site’s WEB \BIN directory. 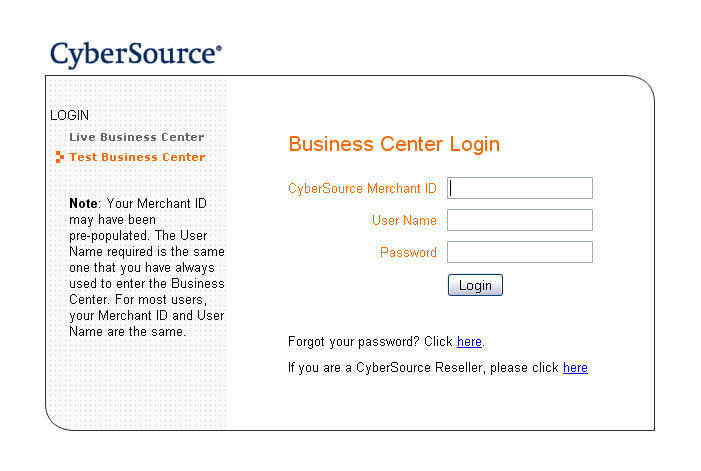 3 - Log in to your CyberSource merchant account. 4 - Go to Account Management, then Transaction Security Keys. 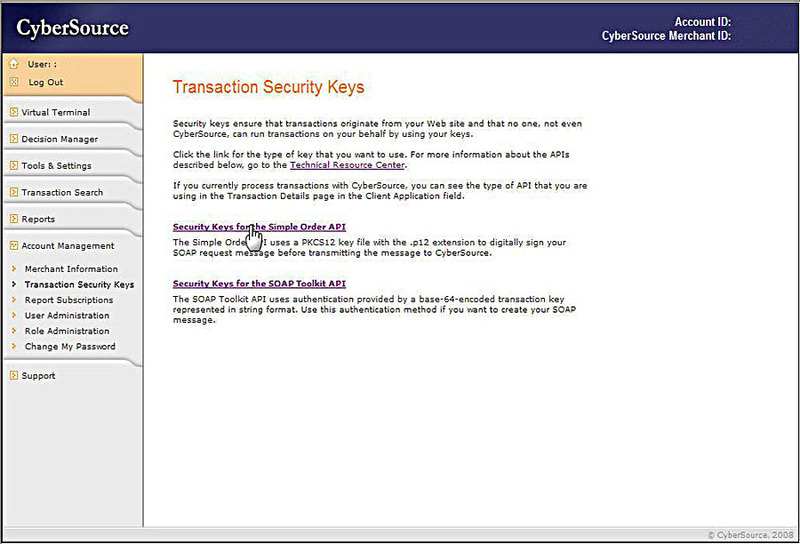 In the Transaction Security Keys page click on Security Keys for the Simple Order API link. 5 - Click on the Generate Key button. 6 - Then click the Generate Certificate Request button. 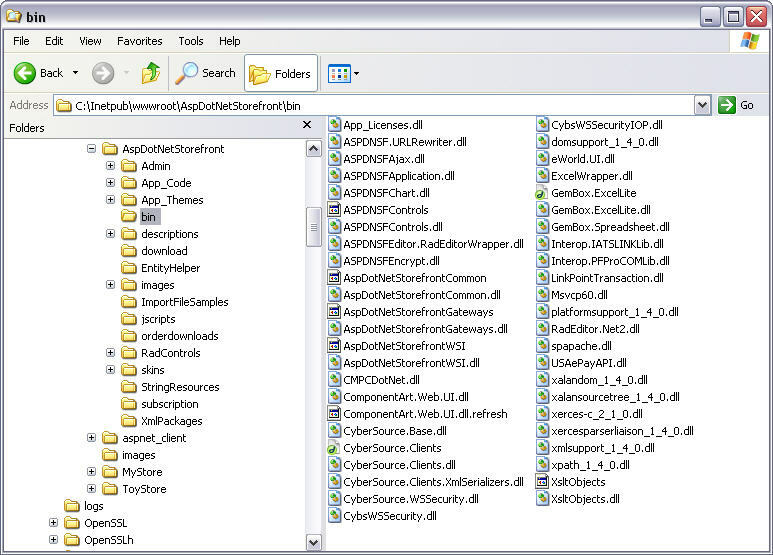 7 - Once the key has been generated, copy it to your sdk directory under the keys folder. The extension of the key must be .p12 and the filename should be the same as your merchant ID. 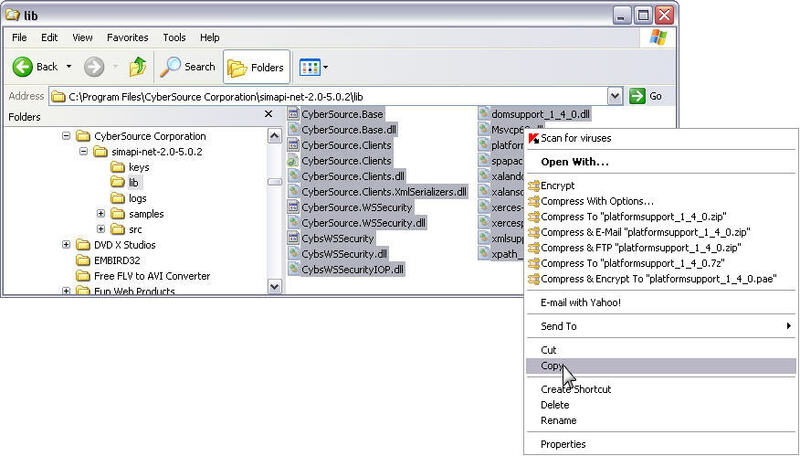 8 - In the store admin console, go to the AppConfig page and search for "CYBERSOURCE". Provide the necessary details for the following AppConfigs: CYBERSOURCE.keyFilename, CYBERSOURCE.keyDirectory and CYBERSOURCE.merchantID. The CYBERSOURCE.UsePIT AppConfig must be changed to “false” when the site will Go LIVE. 9 - Finally, go to Configuration → Site Configuration Wizard in the AspDotNetStorefront admin site and select “Cybersource” from the Payment Gateways section. Click the “Submit” button, and your gateway setup is complete. Q: What CyberSource API should I use for transaction keys? 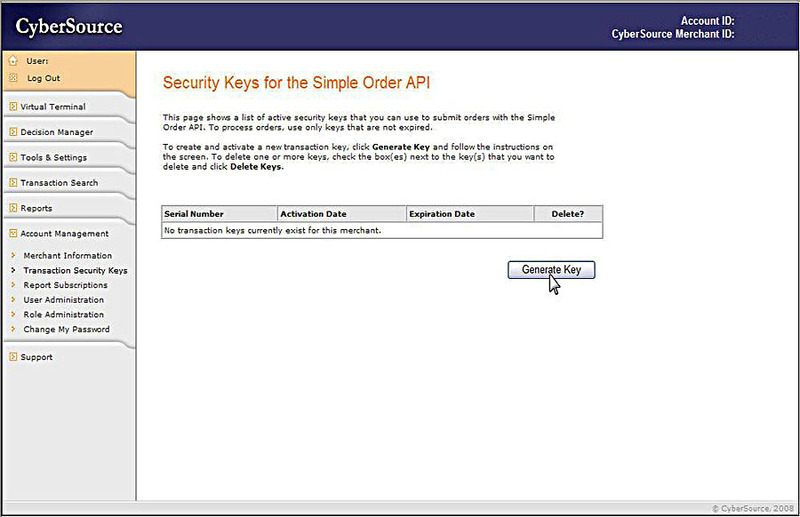 A: Security Keys for the Simple Order API (SOAP). 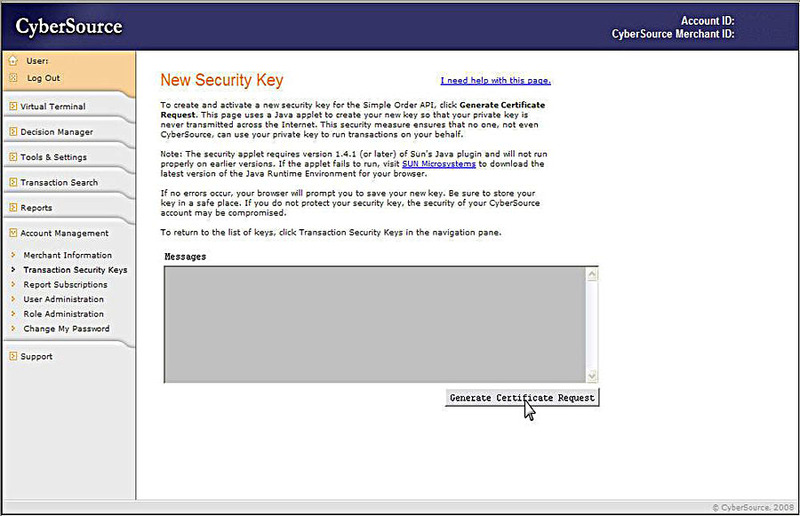 A: The CyberSource application interface was not able to sign the request with the key file. a.	CYBERSOURCE.keysDirectory – should be the absolute path of your SOAP Security Keys. 2 - Does the ASP.NET or NETWORK SERVICE user have read access permission to the key file? A: A transaction can only be voided if CyberSource has not yet submitted the debit or credit information to your processor. Usually CyberSource submits that type of information to your processor once a day, so your window for successfully performing a void is relatively small. CyberSource will decline your void request if the debit or credit information has already been sent to the processor. Note: When you void a transaction, the transaction is at the end of its life. You cannot undo a void, and you cannot perform a follow-on credit for a debit that has been voided. Q: Why won't Cybersource work on my 64-bit server? A: The 3rd party DLLs required for Cybersource to work don't support 64 bit environments. Unfortunately, there is nothing AspDotNetStorefront can do to alleviate this limitation. Q: Can I use my Bank of America account through Cybersource? A: Yes, Cybersource supports Bank of America accounts. See here for more information. For more information about CyberSource error messages, go to the CyberSource page where they have a list of reason codes for the errors and contact CyberSource support directly if you are experiencing these, they should be able to assist you further.